All master classes will take place at Center Stage at 700 North Calvert Street. All master classes will last from noon until 5pm. Each master class is $45, or you can register for all three for $100! Tara Cariaso is a Baltimore-based theatre artist that at times wears many different hats: performer, director, designer, movement instructor, producer, singer, writer, activist. She has worked with local companies such as The Chesapeake Shakespeare Company, Faction of Fools, Distilled Theatre Company, as well as companies beyond the Baltimore/Washington region, including The San Francisco Mime Troupe, The Dell’Arte Company and Sojourn Theatre Company. She received her MFA from the Dell’Arte International School of Physical Theatre with an emphasis on Ensemble-generated work, her BA from UMBC in performance, and a certificate of achievement for mask making and performance instruction from the Sartori Centro Maschere e Strutture Gestuali. Tara is the Artistic Director of Waxing Moon Masks performance company and an instigator of new works. Since their initial performance in January of 2012, WMM has produced three shows for the Baltimore community: One Wish Glitz, a staged reading of a new Commedia play by Kristin Harrison; Take This Medicine!, a clown play at the UnSaddest Factory 10 Minute Play Festival; and Larval Project, an original devised full face mask work showing at Centerstage as part of their celebratory theatre festival called 50fest. Tara makes masks between rehearsals at home with her daughter Nadya, son Kieran, and husband Aaron, and in the Spring she grows her own lettuce. Colette Searls is Associate Professor of Theatre UMBC where she directs a mixture of classical and contemporary works, and has created several original mixed-media puppet plays. Other directing credits include Fixed Boundary at San Francisco’s Exit Theatre (“Best of the San Francisco Fringe Festival”), Vigils at The Woolly Mammoth Theatre Company, and Basura! at the fringeNYC (PS122). She has received grants from the Jim Henson Foundation and Puppeteers of America for her original works in found-object puppetry aimed at adult audiences, and served as a puppetry consultant for professional theatres. Over the past several years she has brought digital puppetry into her live theatre work, and lectured and published internationally on they hybridizing of animation, puppetry, and acting through virtual performance. She is currently leading a team of programmers, along with award-winning animator Lynn Tomlinson, to create a digital puppetry app that artists can manipulate from an iPad. Otis Cortez Ramsey-Zöe is an Associate Artistic Director at banished? productions, Lecturer of Theatre Arts at Howard University, Series Editor for NoPassport Press’s Dreaming the Americas Series, and freelance dramaturg. 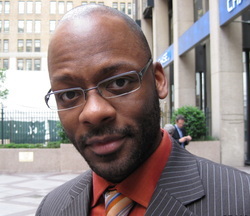 He has developed new works with such organizations as The Sundance Institute, Kennedy Center, Theatre J, Arena Stage and CENTERSTAGE and by such writers as Tim Acito, Colman Domingo, Kirsten Greenidge, Noah Haidle, Jacqueline E. Lawton and Tarell McCraney. Previously, he was Future Classics Program Coordinator at The Classical Theatre of Harlem, Literary Manager and First LookCoordinator at CENTERSTAGE and an Allen Lee Hughes Senior Fellow at Arena Stage.